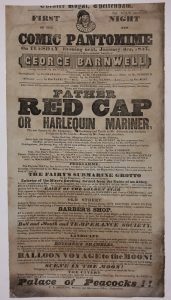 The Wilson holds a collection of over 5000 theatre playbills, programmes and other printed items relating to the theatre and public entertainment in Cheltenham since the late 18th century. A large part of this collection relates to the Theatre Royal, which operated for over half a century from the 1780s, providing a rare insight into theatre-going and the excitement it generated at the time. Also included in the collection is material concerned with Cheltenham’s later theatres and places of entertainment, notably the Everyman Theatre. About 1500 playbills were purchased by the museum in 1917 using funds from the Leslie Young Bequest. In 1930 a similar number was presented to the museum by the Shenton family who had worked as printers in Cheltenham since the late 18th century and were responsible for printing most of the playbills. In more recent times, the collection has been added to by donations of playbills and programmes from Cheltenham’s existing theatres. 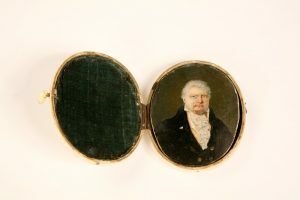 A miniature portrait of John Boles Watson, manager of Cheltenham’s first permanent theatre. The town’s first permanent theatre was built by John Boles Watson in 1782. It was located in York Passage on the north side of High Street. It was here, during his five week stay in Cheltenham in 1788, that George III attended several performances; thereafter the theatre became known as the Theatre Royal. Watson later built a larger Theatre Royal in Cambray Colonnade (now Bath Street). This opened in 1805 and remained a major entertainment venue until 1839 when it was destroyed by fire. Following this, the town was without a permanent purpose-built theatre until 1st October 1891 when the New Theatre and Opera House opened in Regent Street. This theatre, now known as The Everyman, continues to operate today. 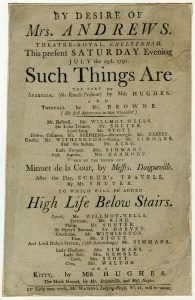 The playbills reveal that theatre-goers were usually treated to a programme consisting of two or three short plays or sketches. Light musicals and frothy farces were popular, as were thundering melodramas, sometimes with blood-curdling stage effects. Interspersed were comic songs and dances (including on at least one occasion a hornpipe danced by a onelegged man). Also featured were extravagant stage effects involving fireworks and explosions (seemingly with little regard to safety), regal processions and masquerade dances. From time to time, whole programmes were devoted to circus-type acts: tight rope artists, acrobats, clowns, fire-eaters and jugglers and even live performing animals. Sometimes these included the ‘exotic’ draw of people from other lands, or those who would now be seen as having physical disabilities. As the Cheltenham season began to extend into winter months, pantomime became popular. A playbill advertising grand entertainments to take place on the 24th and 25th of May. During its time, the Theatre Royal attracted audiences and performers as distinguished as any at the Drury Lane and other famous theatres in London. The playbills (a few even printed on silk) provide a glittering ‘who’s who’ of dukes and duchesses, earls and countesses, and lords and ladies, including such prominent visitors to the town as the Duke of Wellington and Lord Byron. The list of performers they came to see was no less illustrious: Sarah Siddons, Dorothy Jordan (mistress of the Duke of Clarence, later William IV) and the clown Joseph Grimaldi were among those treading the boards of the Theatre Royal. The playbills also highlight the appearances of juvenile performers such as, in 1830, the ‘juvenile prodigy’ Master Burton, aged only 7, and William Betty who was 16 in 1807. 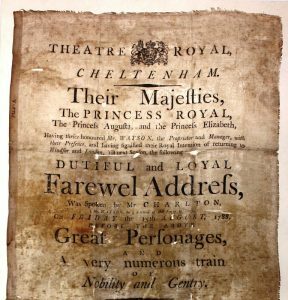 The departure of the royal family at the end of their visit in 1788 is marked by a playbill which sets out a grandly-worded ‘Dutiful and Loyal Farewell Address’ to the majesties; other royal events featured in playbills were the jubilee of George III in 1809 and the accession of William IV in 1830. The naval victories of the Nile and Trafalgar receive special attention and on one occasion prompted performances to raise funds in aid of ‘Nelson’s brave tars’. Special performances were usually put on during Cheltenham’s popular race weeks in the 1820s and occasionally the Stewards of the Races themselves sponsored productions. In contrast, the theatre actually closed down for the Gloucester assizes when the focus of social life in the county switched to Gloucester.